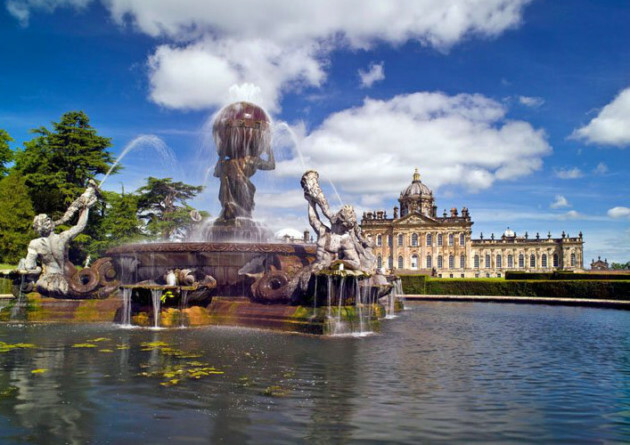 More than 200,000 people visit Castle Howard each year and north Yorkshire’s role in bringing Evelyn Waugh’s Brideshead Revisited to life for millions has no doubt played its part in the mansion’s popularity. Built between 1699 and 1712 for the 3rd Earl of Carlisle and home to the Howard family for more than 300 years, its Baroque and Palladian influences provided the perfect backdrop for both 1981’s television serial and 2008’s big-screen remake. The house is surrounded by a large estate which at one time covered 13,000 acres and included the villages of Welburn, Bulmer, Slingsby, Terrington and Coneysthorpe. The estate was even served by its own railway station from 1845 to the 1950s. Although fire ravaged the house in 1940, much has been restored in the decades since, although some areas, such as the East Wing, were only superficially restored for the 2008 filming. Castle Howard is by no means an empty shell though. Its dramatic interiors are filled with renowned collections of paintings, antiquities, bronzes, furniture and tapestries gathered by successive generations on their Grand Tours. This year there are a number of exhibitions that can be enjoyed by all visitors to the house. Brideshead Restored: The Story of Restoration at Castle Howard and Brideshead Revisited gives visitors a glimpse of how parts of the house were transformed from dereliction to film set, while ‘Maids and Mistresses: The Women of Castle Howard’ celebrates the lives and accomplishments of the many women who have lived and worked at Castle Howard. Guided tours explore the monumental landscape too, scattered with temples, lakes, statues and fountains, or you can amble unaccompanied along the woodland and lakeside paths, as well as through an 18th-century walled garden with rose collection and ornamental vegetable garden. With an ever-changing programme of exhibitions and events, road-train rides to the adventure playground and boat trips on the Great Lake, as well as cafés, gift and farm shops and garden centre, there is something for all the family to enjoy.